R.D. Hill was born March 8, 1901 in Kansas City, Kansas, the youngest of three children born to Charles J. Hill (1865-?) and his wife, Florence May (Andre) Hill (1867-1914). His mother passed away when R.D. was 13 and his father moved away shortly after that, leaving his children behind. R.D. got himself adopted into another family so that he could marry when he was only 19. He was married on September 29, 1920 in Kansas City, Kansas to Hallie Marie Snyder (1901-2008) and the young couple had a daughter, Dorothy Marie, there in 1922. The young family moved to Ponca City, Oklahoma in 1923 so that R.D. could take a job with the railroad. The smells of that job made him nauseous so a year later, R.D. moved his family to Arkansas City, Kansas. R.D. attended a Pratt & Whitney mechanical school in Wichita, Kansas and then opened his own “City Garage” at 215 N. Summit St. in Arkansas City that had an apartment over it for his family. He had become interested in auto racing by then so he got permission from his landlord to build racing cars in the alley behind his garage. He then took a job, first a mechanic and then foreman (now known as a “service manager”), at the Hill Buick Co. (no relation) in Arkansas City. From that job, he moved to the Ruckel–Kilburn Chevrolet dealership where he also served as a foreman. R.D. 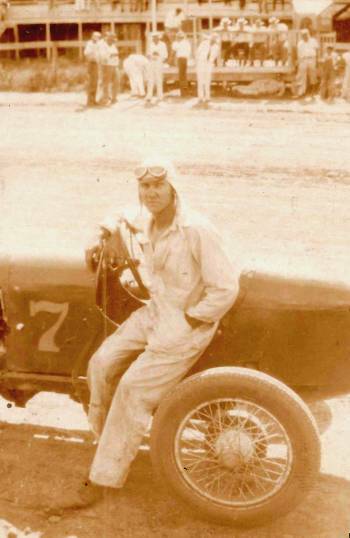 drove his own Ford racing car at first but soon gave that up and while remaining a mechanic on the car he owned. 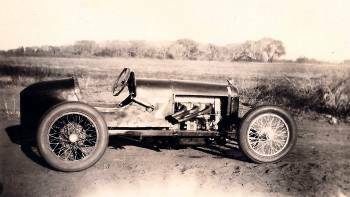 He also built at least one race car, a Chevrolet special, for a customer, Forest Shipman “Blackie” O’Bannon, while he was residing in Arkansas City, Kansas in 1927. R.D. Hill apparently drove a #4 Chevrolet under the alias “A. R. Bobs of Arkansas City, Kansas”. * The car was owned by Dwight Moody of Arkansas City, Kansas. Hill a. k. a. Bobs finished 3rd in the 2nd 8-lap heat race. Russell Hill, local auto race-driver, will be one of the attractions at the Winfield Fair next Tuesday and Saturday when the auto races will be held on the Fair track. Hill's car, a Fronty Ford, is in top shape now and in perfect condition to grab off several of the prizes. The ad above appeared on page 11 of the Arkansas City Daily Traveler newspaper on October 6, 1928. This same picture was used in another ad 11 months later but, in that instance, the driver was identified as Louis "Speed" Irwin, of Arkansas City, KS. If you know who the man, standing beside the car, really was, please contact Bob Lawrence. R.D. Hill entered his #15 Hill Special Fronty Ford in these races sanctioned by A. A. A.
Hill’s name does not appear in the published results of these races. R.D. Hill entered his #15 Hill Special Fronty Ford in these races in which he drove himself. He turned in the 5th quickest time in time trials behind Ira McIntire of Arkansas City; Wendell A. Sparling of Winfield; J. F. Pickens of Arkansas City; and a, so far, unidentified driver. Hill then finished 3rd in the 1st heat race behind J. F. Pickens and Ira McIntire. Next, Hill won the 4th heat race setting a new 6-lap track record of 3 minutes, 27.0 seconds in that event. He then finished 4th in the 15-lap feature race behind Ralph Chrysler of Omaha, Nebraska; Tom Holden of Wakeeney, Kansas; and Happy Fox of Topeka, Kansas. He turned in the 3rd quickest time of 33.4 seconds in time trials behind Wendell A. Sparling and Ira McIntire. Hill then dropped out of the 1st heat race being credited with 3rd place behind Wendell Sparling and Ira McIntire. Hill ran 2nd in the 4th heat race behind Ira McIntire until the final lap when he was passed for that position by Ralph Chrysler. Hill started the 15-lap feature race (all from a standing start) in the middle of the 3-car front row. R.D. was running in 3rd place behind Ira McIntire and Tom Holden at the end of the 1st lap but managed to pass Holden on the 2nd lap and hold that position behind McIntire to the end of the race. R.D. 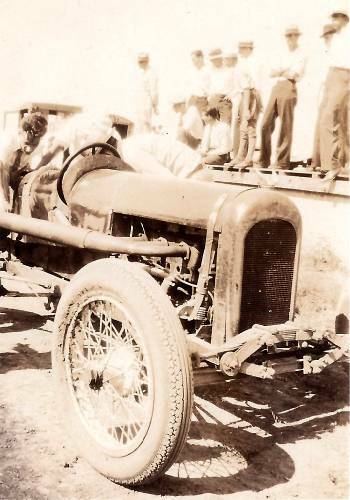 Hill entered his Hill special Fronty Ford for driver Lew Irwin of Iola, Kansas. These races were postponed until April 28, 1929 due to cold weather. Irwin’s name does not appear in the published results of these races. Irwin qualified 7th fastest in time trials at 35.0 seconds and behind Mack McAnally of Winfield, Kansas; Cokey Fuller of Arkansas City, Kansas; Fred Lentz of Hutchinson, Kansas; Bill Mathews of Ft. Smith, Arkansas; Joe Taylor of Ponca City, Oklahoma; and Jack Skillet of Oklahoma City. He then finished 2nd in the 1st heat race behind Cokey Fuller. Irwin was 4th in the 3rd heat race behind Cokey Fuller, Joe Taylor, and Bill Mathews. It is unclear where, or even if, Irwin finished in the feature race that was won by Cokey Fuller. R.D. Hill entered his Hill special Fronty Ford for driver Lew Irwin with Irwin winning the feature race. R.D. Hill entered his Hill special Fronty Ford for driver Lew Irwin. Irwin spun out on his 1st attempt at a time trial but then came back to set the quickest time of the day with a run of 32.7 seconds. Irwin finished 1st in the 2nd heat race. Irwin then crashed through the fence on the 2nd lap of the feature race while leading. He did not complete the feature race which was won by Art Hutchin of Tulsa, Oklahoma. R.D. Hill entered his #5 Hill special Fronty Ford for driver Lew Irwin. Irwin qualified 4th fastest in time trials behind Cokey Fuller, Earl Hovenden of Duncan, Oklahoma, and Cotton Grable of Houston, Texas. Irwin then finished 4th in the 1st match (heat) race behind Earl Hovenden, Cotton Grable, and Cokey Fuller. Irwin finished 1st in the 2nd match (heat) race. Irwin did not finish the feature race due to engine failure. That race was won by Earl Hovenden. R.D. Hill entered his #5 Hill special Fronty Ford for driver Lew Irwin but results of those races have yet to be located. It is unknown where, or even if, Irwin finished in these races but the feature race was won by Sam Hoffman of Sioux City, Iowa. Irwin finished 5th in the 3rd heat race behind Johnny Kreiger of Rochester, New York; Vern McComb of North Chicago, Illinois; Cokey Fuller and Chet Gardner of Denver, Colorado. It is unknown where, or even if, Irwin finished in the feature race which was won by Johnny Kreiger of Rochester, New York. R.D. Hill entered his #7 Hill special Fronty Ford for driver Lew Irwin. Irwin turned in the 3rd fastest time in time trials of 31.4 seconds behind Pat Cunningham of St. Joseph, Missouri and Rea Bray of Hutchinson, Kansas. Irwin then finished 4th in the 1st heat race behind Pat Cunningham, Cokey Fuller, and Rea Bray. Irwin then finished 3rd in the 2nd heat race behind Rea Bray and Jimmie Davis of Duncan, Oklahoma. Irwin’s time for that race was 5 minutes, 40.6 seconds, 11.2 seconds slower than Davis and 23.4 seconds behind Bray. Next, Irwin won the 3rd heat race setting a new 12-lap track record of 6 minutes, 31.8 seconds in the process. That record was yet to be broken when that racetrack ceased operating. Irwin dropped out of the feature race and was credited with 5th place behind winner Pat Cunningham, Rea Bray, Cokey Fuller and Robert Landon of Arkansas City. Lew Irwin was involved in an accident in the south turn on the 1st heat race that eliminated him from competition for the rest of the day. The main event was won by Lawrence Hughes of Beatrice, Nebraska. R.D. Hill entered his #7 Hill special Fronty Ford. It is believed that he drove his own car in these races as Lew Irwin drove a #X-3 Lawhon special that had been entered for Lew Reynolds, and Rea Bray drove his own Fronty Ford. R.D. Hill’s name does not appear in the published results of these races. The main event was won by Vern McComb of North Chicago, Illinois. R.D. Hill’s name does not appear in the published results of these races. The main event was won by John Gerber of Stanwood, Iowa. R.D. Hill entered his #7 Hill special Fronty Ford and is believed to have driven it himself in these races. It is unknown where he finished in these races but the feature race was won by Rea Bray who was driving a #4 Fronty Ford that he owned himself. R.D. Hill entered his #7 Hill special Fronty Ford for driver Rea Bray in these races which were sanctioned by I. M. C. A.
Bray set quick time of the afternoon in time trials with a lap of 30.8 seconds. Bray’s next race was the 7-lap North American Sweepstakes but the engine threw a rod in that event ending his afternoon’s competition. Archie Powell of Galesburg, Illinois won the feature race. at Muskogee, Oklahoma in 1931. R.D. Hill entered his #7 Hill special Fronty Ford for driver Rea Bray in these races which were sanctioned by I. M. C. A. Bray also entered his own #4 Bray special Fronty Ford and ran both cars in time trials. His #4 Bray special ran one lap in 30.8 seconds which was the third fastest time of the day but was .4 seconds slower than Bray ran while driving Hill’s #7 Hill special Fronty Ford. Both of Bray’s times were slower than Archie Powell who set the fastest time of the day in his #3 Fronty Ford at 30.0 seconds for one lap. Since Bray could only run one of the cars in the races, he elected to run Hill’s #7 Hill special Fronty Ford. Bray then finished 2nd to Archie Powell in the dash. Bray again finished 2nd to Powell in the 1st heat race. Bray then won the 2nd heat race after Powell’s engine threw a rod. Powell’s was unable to start the 7-lap feature race and Bray won that one by almost 100-yards of Gene DeMont of Memphis, Tennessee. R.D. Hill entered his #7 Hill special Fronty Ford for driver Rea Bray. Bray finished 3rd in the 2nd heat race behind Lew Irwin and Lou Fenno. The car in the background is the #4 driven by Willard Prentiss. Note the state-of-the-art public address system in use on the racetrack in front of the grandstands. R.D. Hill’s, nor Rea Bray’s name appear in the published results of these races. The main event was won by Sam Hoffman of Sioux City, Iowa. R.D. Hill entered his #7 Hill special Fronty Ford for driver Rea Bray. Bray set a new 1-lap track record in time trials of 29.8 seconds only to have it broken later that same afternoon by Tex West who turned a lap of the track in 28.6 seconds. Tex West of Dallas, Texas also won the feature race on this afternoon. R.D. Hill entered his #7 Hill special Fronty Ford for driver Rea Bray but results of those races have yet to be located. Bray turned in the 7th fastest time in time trials with a lap of 33.25. Bray finished 3rd in the fourth heat race. Bray turned in the 4th fastest in time trials with a lap of 29.83. Bray finished in 3rd place in the 10-lap first heat race. Bray won the 10-lap consolation race. 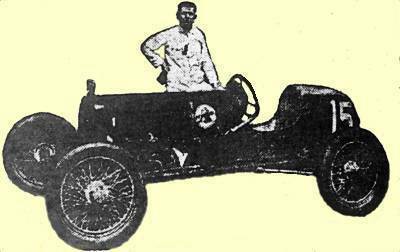 It is unknown where, or even if, Bray finished the feature race that was won by Lew Irwin who was by then residing at St. Joseph, Missouri. Bray’s name does not appear in the published results of these races. It is unknown where, or even if, Bray finished the feature race that was won by Lew Irwin. R.D. Hill entered his #7 Hill special Fronty Ford for driver Rea Bray of Hutchinson, Kansas but these races were canceled due to rain. Bray finished 5th in the first heat race. The sweepstakes race was won by Emory Collins. Neither Bray’s, no Hill’s name appear in the published results of these races. The sweepstakes race was won by Mark Billman. An article in the Arkansas City Daily Traveler states that R.D. 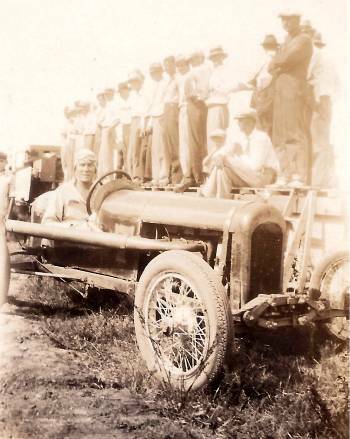 Hill served as one of the official timers at the motorcycle races run on Labor Day, September 5, 1932 at the Arkansas City Speedway a.k.a. West Madison Speedway on the west edge of Arkansas City, Kansas. 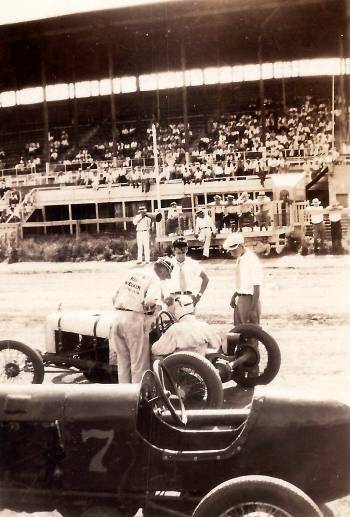 8,000 spectators saw Bray finish in 6th place in the 6-car, 10-lap 3rd heat race behind Ted Davis of Junction City, Kansas; Bill Carroll of Lewis, Kansas; Herb Hunter of Hoisington, Kansas; Glen Dunlap of Newton, Kansas and Speck Heminger of Hastings, Nebraska. With the onset of the Great Depression, times got tougher. When R.D. and Hallie had a second daughter, Marilyn, R.D. turned his attention away from racing and more toward making a living for his growing family. R.D. sold his #7 Hill special Fronty Ford in 1932** and had moved his family to Superior, Nebraska by 1935. Noticing there were no petroleum pipelines in that part of the country at that time, R.D. started building tanker trucks to haul petroleum products for the Kerr-McGee Oil Co. and the Champlin Oil Co. In 1936, R.D. moved his family to Yankton, South Dakota where he engaged in a number of businesses including owning a mobile home park, rental housing, engaging in farming, and constructing a building to house the local “Tastee Treat” franchise. R.D. also operated a small Champlin gasoline service station on the edge of Yankton and sold petroleum products both retail and at wholesale to other service stations. 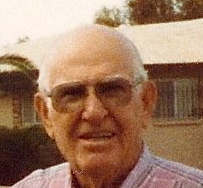 He and his wife, Hallie, retired in 1972 and moved to Mesa, Arizona where they built a new home. R.D. Hill suffered a heart attack and passed away at Mesa on May 18, 1984. He is buried in the Yankton City Cemetery at Yankton, South Dakota. Hallie died on September 4, 2008 at Yankton at the age of 107 and is buried beside her husband in the Yankton City Cemetery. * The story of these races that ran in the Winfield Daily Courier used the alias while the story about these same races that appeared in the Arkansas City Traveler used Hill’s real name. ** Did R.D. Hill sell his #7 Hill special Fronty Ford to Rea Bray or, maybe, to someone else? Bray kept his #4 Bray special Fronty Ford but also began racing a #7 Rajo Ford at about that same time. Could that have been the same car with at least a new head on the engine? Those are among the many questions still to be answered about the Bray / Hill connection and whatever became of the #7 Hill special. If you can answer those questions, or if you know anything more about R.D. Hill, Rea Bray, or their involvement in auto racing, please contact Bob Lawrence. Note: The photographs on this web page have been copied from Russell D. Hill’s personal photo album. R.D’s wife, Hallie Marie (Snyder) Hill, has written “Muskogee, Oklahoma - 1931” on the ones that were taken there. Rae Bray was identified in these photos by R.D. and Hallie’s daughter, Dorothy (Hill) Johnson, who says she remembers seeing Bray when he visited her father.